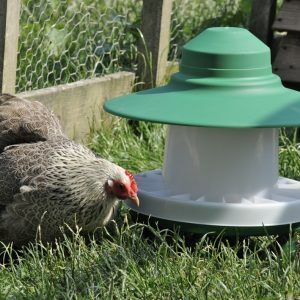 The Blenheim is an ideal feeder for uses both inside and outside the chicken coop, this feeder will accommodate most breeds of poultry as well as some smaller breeds of waterfowl. 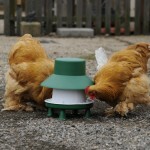 This feeder is suitable for up to 6 to 8 standard sized chickens if filled on a daily basis. 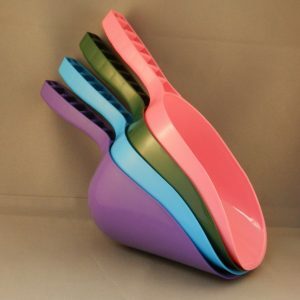 The capacity of the feeder is 6kg feed and is very easy to fill from the top, it can also be easily dismantled for cleaning purposes. The design is perfectly suited to all types of feed including pellets, wheat, corn and mash, the main feed tube is fixed at the correct height to control the flow of feed to the correct level, this saves food waste and also removes the need for any height adjustments. The anti spill grid that fits into the base of the tray prevents the birds from scratching food eliminating waste. 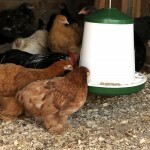 The feeder can be suspended inside the coop by fastening a suitable chain or rope to the metal support fitted across the top of the feeder especially for this purpose. (Make sure hanging height will suit the size of chickens you keep allowing them to reach the feeder) a plastic indoor lid is supplied to prevent dirt and insects from entering the feed. Alternatively the feeder can be free standing on the floor by using the optional 3-inch legs that can be supplied with the feeder, these legs will help to prevent the feed from becoming contaminated from the chickens scratching the bedding on the floor of the coop. Keeping feed clean and dry is very important to comply with today’s bio security standards. This feeder is ideally suited for outdoor use as a free standing feeder, the outdoor version comes complete with legs and a rainproof hood, the hood is a very easy press fit on the top of the feeder. 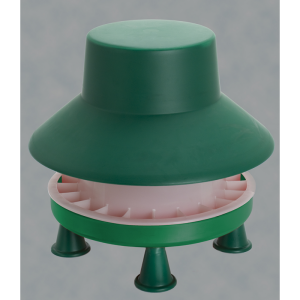 It is also easy to remove when filling the feeder; it also gives total protection in all weathers. The 3-inch legs will keep the feeder high enough from the floor to keep the feed rim free from water and dirt and a with the indoor version this protects the feed from becoming contaminated. Be the first to review “6kg Blenheim Feeder” Click here to cancel reply.